Sleeping goose shells work like a dream. 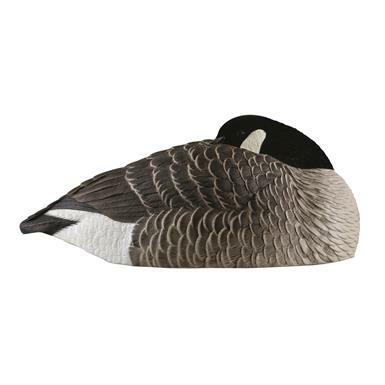 Give your goose decoy spread a more life-like appearance with a set of Avian-X® Painted Canada Goose Sleeper Shells. This set of 6 will add just the relaxed and realistic look you need to convince late season honkers that it is safe to respond to your call. By designing these oversized shells to stack tight they take up minimal room in your trailer, truck or ATV so you can use more of them to replicate a large flock taking a well deserved break from their journey. Avian-X Painted Canada Goose Sleeper Shells are molded with industry-leading rubberized plastic to ensure that you get years of use and better paint adhesion in even the coldest of climates. Dimensions: 23" x 12" x 8"h.